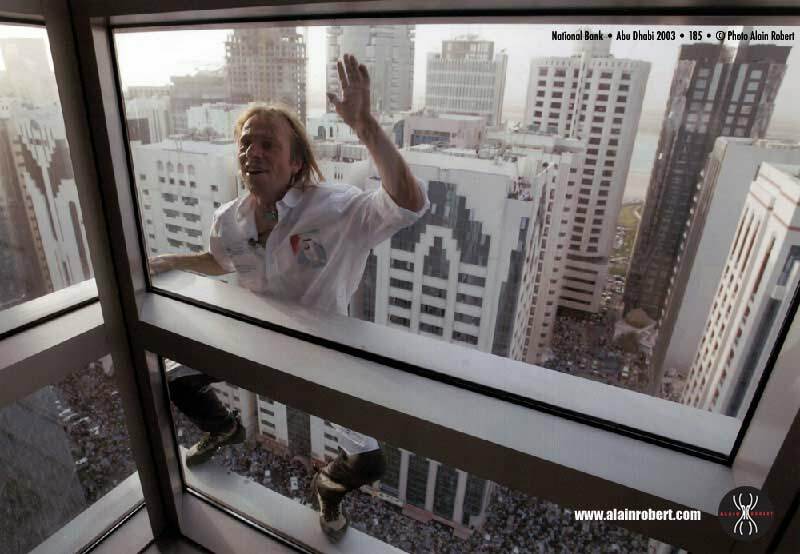 Alain Robert is known simply as the French Spiderman. A man who claims to suffer from vertigo (the feeling of motion while one is stationary), and who says injuries have left him 66% disabled, is also the man that is known for climbing the world’s tallest structures. So far, he has climbed over 70 steel giants, from the Willis Tower in Chicago, USA, to the Petronas Towers in Kuala Lumpur, Malaysia. He is French, speaks with an accent, has been arrested many times, and has a entertaining website. He also rarely uses ropes or harnesses. Yep, he goes au natural and free climbs his way up these iconic structures! And he has now added the world’s tallest building, the Burj Khalifa in Dubai, to his lists of conquests. Thankfully, this being the biggest of them all, he was asked to use a harness for his ascent. It took him 6 hours to climb the 2716.5 feet. “I do understand. You know, this is such an iconic building so I can understand that even though they are taking care so much about my precious life, they are also taking care a lot of that precious Burj Khalifa,” Robert said, cryptically. Watch him climb the scintillating tower below, rising up as the sun set below him. What do you think about the crazy Frenchman?